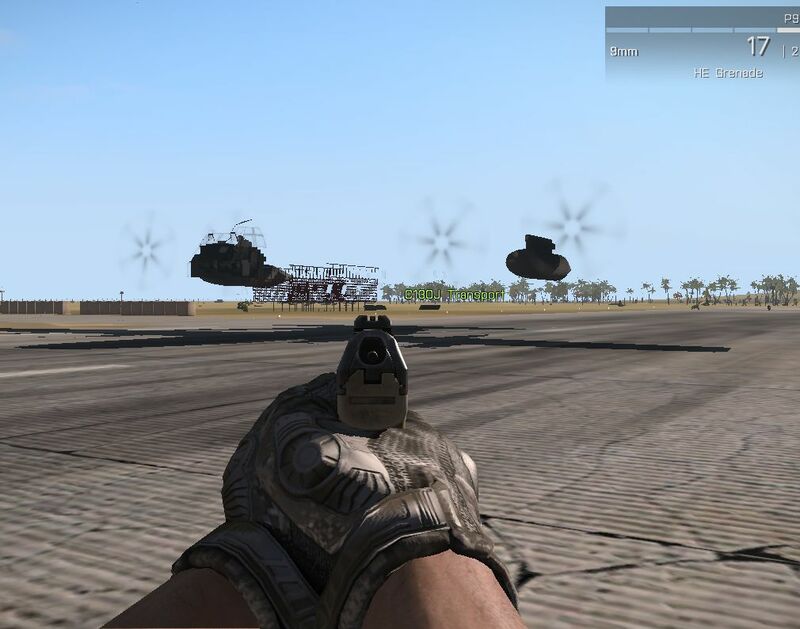 So after much thought I have decided to release the port of the C-130J from Arma 2. This was originally just for the @CAF pack, but I have received a lot of requests for it. BIS for the original model, textures and config. HUD applied to copilot seat, HUD is now on pilot's helmet visor. Transport: changed the get-in positions. Crew door, Bottom of ramp, top of ramp, rear side doors. Ramp should be 100% walk-upable now. What did you add into the IgiLoad script so that we can use this with supplies and such? And thank you so much for this! We have been needing this for a while now. Awesome work sir! Thank you so much. One video and one error. Warning Message: Cannot load texture ca\data\env_land_co.paa. Nice, will test it today right after the work. Finally nice parajump action is back! Mmm very tasty, i will have a play tommorow. I'm getting the see-through version. Ho-hum. Can you have a small vehicle with players inside and let them just drive it out of the opened ramp? The cargo version seems to have throttle issues. Can't get the plane to move when placed on ground. Engines start up but the throttle won't work. When placed as 'flying' in the editor everything works fine. At first, we thank you for releasing this awesome airplane that I really missed. We tried to practice airborne operations and we encountered the following problem : every paratrooper is dying when he's jumping because he strikes the rear part of the airplane. The freefly trooper appears inside the airplane, and even if the ramp is open, he dies. On the other hand, the pilot doesn't encounter this problem. I think that one way to fix that could be to define the same "jumping place" for every passenger exactly where the pilot's "jumping place" is. Any chance for a server Key ? Works fine for me, if you have a joystick plugged in check your throttle and brake controls something might be conflicting. Wow! This is great! Have the standard mirrored textures been replaced? The transport version works just fine, so it should not be an issue with the controls. You have tested both versions? I place c-130j cargo and C-130j transport down as empty in the editor at the airport tarmac. The transport version has no problems. With the cargo version I can start the engines but increasing throttle have no effect. Lowering flaps or use tail rudder seems broken as well, at least no visual movement when I lower flaps or move rudder. No other mods, running the dev branch. BUT,... Has anyone ever figure out how to get these to FLY and STAY FLYING at 30,000ft for a "True" HALO Jump??? It seems the max height we can get is about 2-3k meters or so, then do a script to plop us up 11K meters somewhere.